This was a lovely soup today. It was slightly sour, the rhubarb flavor was not so evident. But the mixture of all the flavors together was quite refreshing and filling. 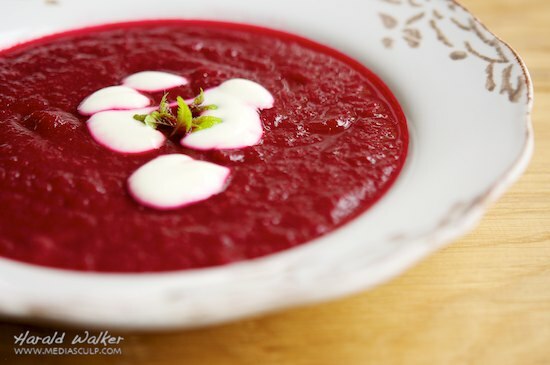 Place the beets in a large soup pot with 2 cups of water and bring to a boil. Once boiling, add the bouillon cubes and turn to a simmer. Clean and chop the rhubarb. Place in a saucepan add 1/4 – 1/2 cup of water and cook until the rhubarb is soften. Add the cooked rhubarb to the beets. When the beets are soft, puree. If you wish to have a thinner soup, add some water to thin. Add the cinnamon, and Tabasco or cayenne and 1-2 teaspoons of sugar, depending on your preference. Serve the soup warm or cold with a dollop of soy yogurt. We garnished the soup with a few young lemon balm leaves. The soy yogurt is an important ingredient to bring out the flavors. 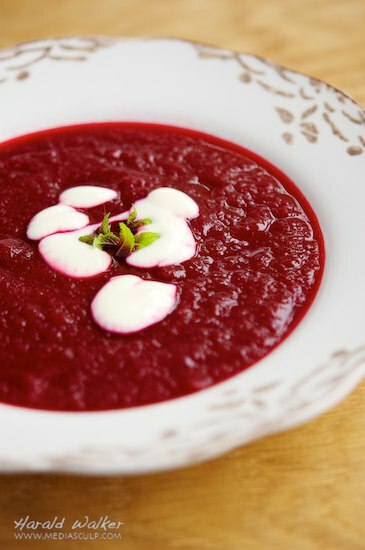 Posted by Chris Walker on June 6, 2012 in Beet, Rhubarb, Soups, Soy yogurt.